Red Carpet with Nancy Wilson, Mike McCready. Recently played a MusicCares benefit at the Showbox. This picture was in the Seattle Times. Mike McCready was presented the Stevie Ray Vaughan Award. 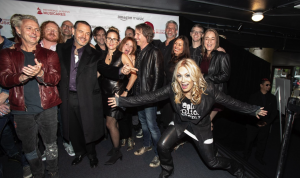 I got to perform with Nancy Wilson (Heart), Duff MacKagan (G & R), and Chad Smith (Red Hot Chili Peppers), along with the bands Flight to Mars and Shadow.